Ventana Research, a leading benchmark business technology research and advisory services firm, released its latest benchmark research on Operational Intelligence, a category of technology that provides continuous, real-time analytics over Big Data, transactional data, and business processes to enable continuous insight and immediate action. 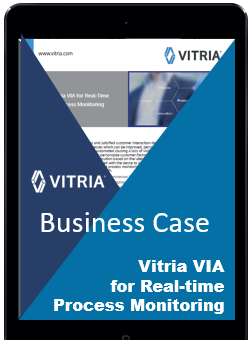 Vitria Technology, Inc., the Operational Intelligence Company, sponsored and contributed in the research along with Splunk and IBM. The research was conducted to investigate how organizations use real-time operational and event data to make better, faster decisions and respond more effectively to gain a competitive advantage. The research findings show that the number of organizations collecting and monitoring real-time intelligence has increased from 47% to 61% in the past year. However, only 18% of participants use this real-time Operational Intelligence to understand, collaborate and improve their business and operational processes. With proper use and adoption, Operational Intelligence results in reduced risk, streamlined operations and supported actions to be taken and decisions to be made with better context. This benchmark research reveals a business environment that requires the attention of management to effectively use Operational Intelligence in both business and IT to ensure the benefits are fully achieved.